The adage once was “Money changes everything.” It’s time to add “technology” to that adage, and clinical supervision in healthcare is now a different ballgame because of it. The number of people in the United States who use the Internet at home, work, or school has continued to increase, according to surveys conducted for the Pew Research Center Internet & American Life Project (Madden, 2006). Findings from the 2006 Pew Research Center survey indicated that 73% of participants used the Internet to shop, pursue personal interests, or enhance their work. Few would disagree that technology has contributed to significant changes in personal lives and professional cultures, and clinical supervision in healthcare is no exception. Patients and providers increasingly use the Internet to obtain information about a variety of healthcare needs. Twenty-two percent of the female respondents and 17% of the male participants in the 2006 Pew Research Center survey noted that the Internet improved their ability to obtain healthcare information (Madden, 2006). Healthcare providers, including social workers, have participated in telehealth, which Nickelson (1998) defined as “the use of telecommunications and information technology to provide access to health assessment, diagnosis, intervention, consultation, supervision, education, and information across distance” (p. 527). Examples of populations that have benefited from clinical services via telephone, videophone, or telemonitoring include frail elders (Duke, 2005), people with diabetes (Hopp & Hogan, 2009), individuals with schizophrenia (Rontondi et al., 2005), and behavioral health clients (Surface, 2007). 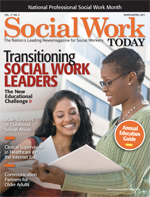 Many current social work supervisees have been surrounded by technology since birth in the forms of computerized baby toys, video games, computers, cell phones, e-mail, the Internet, instant messages, and social networks. Prensky (2001) purports that these recent generations “think and process information fundamentally differently from their predecessors” (p. 1). He refers to people born into the digital language world of technology as digital natives. They are accustomed to accessing information quickly and continuously, receiving instant gratification, multitasking, and simultaneously using multiple programs such as instant messaging, word processing, and e-mail. Digital immigrants, in contrast, is Prensky’s moniker for those who did not grow up in a digital language environment and who may have acculturated to it in varying degrees. What does this growth in the use of technology have to do with social work supervision in healthcare? As the relative percentage of digital natives in the United States dramatically escalates, supervisors are increasingly challenged to understand the ethical, legal, and treatment implications of the use of technology for clients, supervisees, and themselves. Failure to manage the appropriate use of technology could give rise to supervisors misusing it and, through the doctrine of vicarious liability (Reamer, 1993), being found accountable for actions or inactions performed by their supervisees. • Michael was a young, good-looking social worker in a small, rural hospital that did not have on-call services for patients who needed care outside of business hours. Michael had provided supportive treatment and case management services to Gabriella, a 19-year-old woman, and her parents since she was diagnosed with type 1 diabetes at age 14. During her last hospitalization, Gabriella confided to Michael that she was having a difficult time with her parents. When she was ready to be discharged, Michael gave Gabriella his home phone number and encouraged her to call him if she wanted to continue to talk. Over the course of a few weeks, they had lengthy and frequent telephone conversations, and it became increasingly evident to Michael that Gabriella had developed a crush on him. He explained to her that he cared for her and wanted to help her but did not share the same amorous feelings. Gabriella became extremely distraught, arrived at Michael’s home after a three-hour drive, and threatened to shoot both of them if he rejected her. Fortunately, Michael was able to persuade Gabriella to admit herself to the hospital, where she received successful psychiatric and medical care. Supervisors might avoid similar problematic situations involving the use of technology if they preemptively examine the steps taken by supervisees to protect clients by setting clear, appropriate, and culturally sensitive boundaries as stated in standard 1.06. An examination of Gabriella’s ego functions, developmental stage, and family issues in addition to Michael’s motivations could have indicated this boundary crossing. The supervisor might also attempt to heighten Michael’s awareness of the power differential in his relationship with the patient. Finally, the supervisor might have asked Michael, “If you give her your telephone number, what might be the consequences?” While there are other ways Gabriella could have found Michael’s address with his telephone number, in this case, she was able to find it through reverse look-up on the Internet. • Despite the fact that his supervisor discouraged him from friending clients, Dan accepted an invitation to friend a patient’s father. Dan was confident that he and the father would have become personal friends if they had met under different circumstances, and he was genuinely interested in keeping up with the patient’s and the family’s progress. Dan later saw a posting on the father’s Facebook page that concerned him and shared his unease with his supervisor. Although many practitioners would likely decline offers to friend patients, little evidence-based research exists to inform practice. Dan’s supervisor could use this case to explore Dan’s boundary issues. The supervisor could then initiate a discussion of whether Dan should address the posting with his client and/or the family member. The supervisor also could follow Lehavot’s (2009) suggestion that an invitation from a client to friend a clinician could be an opportunity to explore a client’s request within the context of treatment. What would it mean to the client for the clinician to be a friend on Facebook? Could the client be testing boundaries? Self-disclosure, or the revelation of clinicians’ personal information to clients, has been viewed as a potentially harmful technique for two reasons. Although some self-disclosure has long been considered either unavoidable (e.g., race, gender, pregnancy) or accidental (e.g., media coverage, chance encounters), “the Internet has irreversibly changed the nature of self-disclosure and psychotherapists’ transparency” (Zur, 2009, p. 22). The Internet has enabled responsible clients to access relevant professional information about social workers’ education, licensure, certifications, specializations, and malpractice complaints. Clients can use Internet search engines to locate personal information about clinicians such as home addresses, photographs, family members, religious affiliations, political contributions, and even crime reports. Many individuals also use social networking sites such as MySpace, Facebook, and Twitter for personal and professional purposes such as advertising. • Maria befriended her supervisor, Nancy, on Facebook and checked out recent postings of the bridal shower that Nancy hosted for another staff member. The supervisee was astonished to see pictures of Nancy noticeably intoxicated and wearing a coconut bra. Although the coconut bra was worn over other clothes, Maria was unable to get the visual out of her mind when she met with Nancy for supervision. Should supervisors be allowed to have a life outside of work? Can supervisors be friends with supervisees as long as they keep personal issues outside of the workplace? How would knowing about the personal actions of the supervisor affect the dynamics of supervision? • Work was stressful and Susan routinely used Facebook to gain emotional support from her friends about her job-related frustrations. Thinking that she had deidentified the patients, Susan blogged about the problems of patients and families and her responses to them. Unfortunately, a friend of a friend realized that Susan had talked about one of her relatives and reported Susan to The Joint Commission for a HIPAA violation, which was reported to the Office for Civil Rights. Susan, her supervisor, and the hospital faced a large fine for breach of confidentiality, not to mention an unannounced survey by The Joint Commission and possible terminations of employment. Did Susan’s organization provide adequate education regarding patient privacy that included warnings against the use of social networking sites to debrief professional activities? Did the supervisor discuss these potential pitfalls with Susan? • Janice was manager and clinical supervisor to members of a midsized social work department. Since she was assigned a smartphone three years ago, Janice has been “always on” to her administrators and staff with the exception of a two-week vacation to a remote location. Increasing numbers of supervisees learned to correspond about routine matters outside of normal work hours. Janice prided herself on replying immediately to their work e-mails, and she smugly wondered, “How come I am the only one working so hard?” She also began to view the supervisees who didn’t answer her frequent after-hours solicitations as uncommitted. Does “off-the-clock” work allow employers to take advantage of supervisors and, by extension, supervisees? Could adherence to the covert norms of 24/7 availability contribute to favoritism of certain supervisees? How much time do supervisors spend in unpaid work? What responsibilities do supervisors have to guide and model work-life balance for their supervisees? As departments and organizations have merged to contain costs, managers and supervisors have assumed oversight of supervisees who are spread over a large campus or distant ancillary or global locations. When face-to-face supervision becomes a rarity, cybersupervision in the forms of teleconferencing, text messaging, e-mailing, instant messaging, chatting, and videoconferencing can substitute for in-person sessions. Some critical issues to be considered are the fact that confidentiality can be breached, legal and malpractice issues can blur when state or national boundaries are crossed, and state regulations regarding the use of technology for supervision vary (NASW, Association of Social Work Boards, 2005). Supervisors face numerous challenges in supervising off-site supervisees, including establishing mutual trust and confidence in the absence of daily contacts, monitoring supervisees’ accountability to clients and organizations (e.g., tardiness, attendance), evaluating supervisees who have site-specific variations in standards for clinical competency, providing high levels of structure and creativity, and using technology such as text messaging or even poor-quality videoconferencing that obscures the nonverbal communications necessary for giving and receiving feedback. Multisite supervision requires more structure and creativity than traditional supervision. In an age when one manager or supervisor oversees supervisees in multiple sites or systems, it may be impossible for them to have the usual, frequent on-site supervision of the past. The appropriate use of technology could help the supervisor and supervisee assure competency, build a stronger relationship, and help the supervisee feel connected to the broader organization. Such efforts might increase retention while using the supervisor’s time efficiently. The availability of the Internet and technology has strongly impacted attitudes and practices regarding issues such as boundary crossings, self-disclosure, privacy, and delivery of clinical supervision. In some areas, technological advances have preceded the development of associated ethical, legal, and practice standards for the use of technology. Supervisors have a responsibility to educate and oversee the appropriate use of technology by their supervisees and also ensure that employing organizations provide adequate training and safeguards. —Carlean Gilbert, DSW, LCSW, ACM, CGP, is an associate professor in the School of Social Work at Loyola University in Chicago and editor of The Clinical Supervisor. —Carol Frazier Maxwell, LCSW, ACSW is director of social work, family services, and interpreter services at Arkansas Children’s Hospital in Little Rock. Duke, C. (2005). The frail elderly community-based case management project. Geriatric Nursing, 26(2), 122-127. Gutheil, T. G., & Gabbard, G. O. (1993). The concept of boundaries in clinical practice: Theoretical and risk-management dimensions. American Journal of Psychiatry, 150(2), 188-196. Gutheil, T. G., & Gabbard, G. O. (1998). Misuses and misunderstandings of boundary theory in clinical and regulatory settings. American Journal of Psychiatry, 155(3), 409-414. Hopp, F. P., & Hogan, M. (2009). Community-based tele-health systems for persons with diabetes: Development of an outcomes model. Social Work in Health Care, 48(2), 134-153. Kroll, J. (2001). Boundary violations: A culture-bound syndrome. Journal of the American Academy of Psychiatry and the Law, 29(3), 274-283. Nickelson, D. W. (1998). Telehealth and the evolving health care system: Strategic opportunities for professional psychology. Professional Psychology: Research and Practice, 29(6), 527-535. Reamer, F. G. (1993). Liability issues in social work supervision. Administration in Social Work, 17(4), 11-25. Reamer, F. G. (2003). Boundary issues in social work: Managing dual relationships. Social Work, 48(1), 121-133. Rotondi, A. J., Haas, G. L., Andersoln, C. M., et al. (2005). A clinical trial to test the feasibility of a telehealth psychoeducational intervention for persons with schizophrenia and their families: Intervention and 3-month findings. Rehabilitation Psychology, 50(4), 325-336. Surface, D. (2007). Country comfort — Mental health telemedicine in rural America. Social Work Today, 7(1), 28-31. Zur, O. (2009). Psychotherapist self-disclosure and transparency in the Internet age. Professional Psychology Research and Practice, 40(1), 22-30.